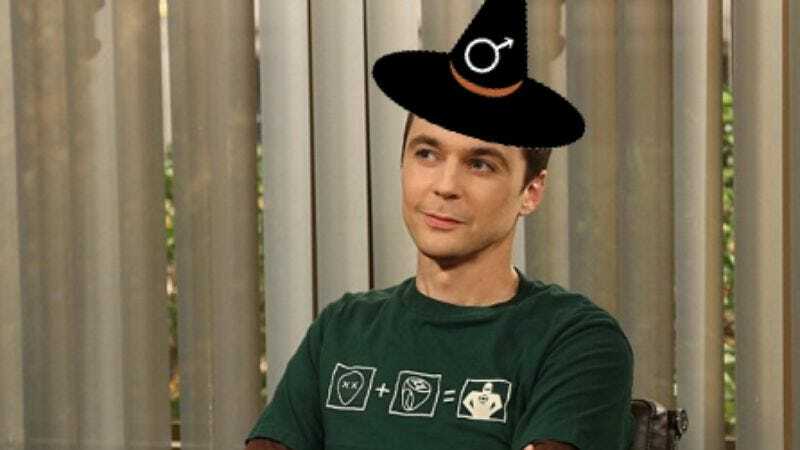 Flipping the bird at perfectly good worlds like “wizard” or “warlock,” Big Bang Theory star Jim Parsons is in talks to resurrect Man-Witch, a long-gestating film about a witch who is also a man. Parsons—who rarely departs stately Bazinga Manor for the grubby world of film—will potentially star in the movie, playing a man who finds out that he’s also a witch, even though witches are usually women, and you get how it goes from there. Parsons’ character (suggested code name: Wan Mitch) is a teacher who discovers his witch-like powers (broom-riding, spell-casting, being a woman, usually) and is sent by a coven to a special witch’s school, otherwise populated by little girls. From there, hilarity is suspected to ensue, as Parsons argues with tiny children about which Man-Witch is which, and everyone else remembers that time Hermes yelled “My Manwich!” on Futurama. Much like an aging, movie-loving magical practitioner with a poor grasp of levitation spells, Man-Witch has been floating around Hollywood for years. The Hangover’s Todd Phillips was originally attached to direct, with his frequent collaborator Zach Galiafanakis and Jack Black both up for the starring role. Phillips has since departed the project, though, taking his potential Men Witches with him when he went.